My Instant Guru specializes in design, setup, and maintenance of networks from 5 to 1000 users and they have been serving small businesses in southern California since 1999. They can help any company with workstations and a server and we were more than happy to help them with their mobile advertising. Vehicle wraps are a great way to advertise your business and services 24/7. The mobility of the advertisement helps you get a high number of impressions on a daily basis even while your vehicle is parked. There are a few options when it comes to different types of vehicle wraps. Full Wrap- A full wrap covers your entire vehicle from end to end, and may include bumpers, roof, mirrors, and perforated window film on your rear and side windows. A full vehicle wrap provides high impact and dramatic marketing image. Full vehicle wraps are made by printing your image on special high-performance, adhesive-backed vinyl which is then sealed with a protective UV laminate film. This ensures your vehicle wrap will last and protects your investment. Expert installers then apply this vehicle-sized decal to your car, carefully stretching and placing it in all the proper grooves and contours. Partial Wrap- A partial wrap integrates the color of the vehicle into the design of the wrap. With a partial wrap, anywhere from 1/4 to 3/4 of the vehicle is wrapped, with spot graphics or decals strategically placed to finalize your marketing message and the design. A properly designed and installed partial wrap can be just as impactful and effective as a full wrap, without the cost of a full wrap. 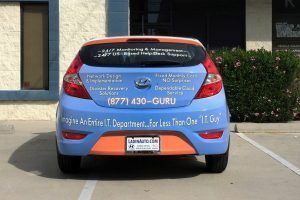 Car Graphics- A more economical option is to add car graphics and text to the doors and the rear of your vehicle. This still allows you to advertise your business but at a fraction of the cost. As you can see in the photo above, My Instant Guru decided to go with a partial wrap. The car was originally white so we only wrapped the back end of the car along with part of the back doors and applied their company logo and website link to the driver’s door and the passenger door. The white paint of the car served as a great base for the graphics and the logo. 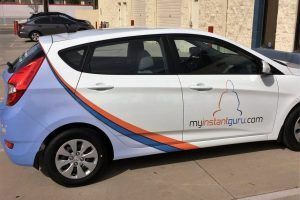 We wrapped the backside of the car with digitally printed blue and orange vinyl, which are their logo colors, and included the company’s services and their phone number so they can advertise even while in traffic. The text is all white aside from the phone number which is white text outlined in orange to help it stand out. Everything we applied to the car was digitally printed onto and cut out of car wrap vinyl aside from the letters on the rear window. For the rear window letters, we plotted the text out of white vinyl. Follow this link to check out other vehicle wraps that we have done. If you are interested in getting a vehicle wrap done, you can request a free quote by clicking here.